p. 14: Variation Rhubarb Upside-Down Cake: Brush the bottom and the sides with butter. p. 77: Crème Anglaise for the Coconut Silk Meringue Buttercream: The weight of 3 egg yolks should be 2 ounces/56 grams. p. 119: Génoise: Due to the lower ratio of yolk to white in most eggs, we are now recommending to add an extra egg yolk (1 tablespoon plus 1/2 teaspoon (17 ml)|0.7 ounce|19 grams) to ensure a fine texture. Also it is important to use a non-GMO cornstarch to achieve a fine texture. p. 145: Tea Ganache: The instant powdered lemon tea weighs 0.3 ounce/8.4 grams. p. 210: Black & Blueberry Pie: blueberries 255 grams / now 1-3/4 cups. p. 251: Pomegranate Winter Pie, Special Equipment for Crisp Meringue Pie Shell: Instead of coating the pan with shortening and flour, spray it lightly with non-stick cooking spray and coat it with cornstarch. It will make removing the slices much easier. Also, it's fine to spread the meringue instead of piping it, but be sure to make an even thickness. p. 313: Ricotta now comes in 15 ounce/425 gram containers which is fine but if you are using volume it would be 1-3/4 cups (the volume listed was incorrect). p. 314: Pasta Frolla for the Pizza Rustica: Roll it 1/8 inch to 1/4 inch thick (1/8 if you like a thinner crust.). p. 334: Luxury Oatmeal Cookies: The volume of the oatmeal should be 2-3/4 cups. p. 338: Gingersnaps: Use volume, not weight for the ground ginger. The weight should not be indicated and 3 grams is not correct. p. 347: My Chocolate Chip Cookies: Baking time should be 7 to 10 minutes. and on p. 350: Bake for 4 minutes; rotate and continue baking for 3 to 6 minutes. p. 374: Pizza Rustica: top of the page, 2nd line, the dough should be rolled 1/8 inch thick, not 1/4 inch thick. p. 388: Mini Gateaux Breton: in the chart, the entry for the butter should read (high quality lightly salted butter). This will refer to the Note on page 390 re using Vermont lightly salted butter. p. 485: Kouign Amann: End of the first turn paragraph, the weight of the finished dough will be almost 2 pounds/900 grams. The closest approximation of light brown and dark brown sugar is the following. The weight will be the same but the amount of molasses is slightly higher and more similar to Muscovado. These cakes are presented in the order in which they appear in the book. The only ones listed are the ones where self-raising flour was called for and is now being replaced by bleached cake flour and the addition of baking powder and in some cases other adjustments in sugar or butter are made. This terrific recipe from Rose's Christmas Cookies has a small mistake that no one has noticed before. The reason, I think, is because 1 can of sweetened condensed milk used to be 15 ounces/430 grams so no one paid attention to the volume measure which was incorrectled listed as 1-2/3 cups whereas it should have been 1-1/3 cups.But now 1 can is 14 ounces/200 grams which is actually 1-1/4 cups. This should be fine to use as it's only 4 teaspoons less but if manufacturers decide to shrink the can anymore we may all be in trouble for many beloved recipes! pages 46, 176, & 402 White Chocolate Buttercream: When making the custard base, instead of bringing the temperature to 140˚F/60˚C, it should be 160˚/71˚C (this prevents the enzyme in the egg yolks from thinning the mixture after it is completed). p. 96 Chocolate Banana Stud Cake, ...set an oven rack in the lower third of the oven and preheat the oven to 350˚F/175˚C. p. 124 The Dreamy Creamy White Chocolate Frosting, powdered sugar variation: the powdered sugar should be 3 cups/12 ounces/345 grams. p. 328 Baby Lemon Cheesecakes, ...set an oven rack in the lower third of the oven and preheat the oven to 350˚F/175˚C. Thanks to the Heavenly Bakers of the <em>Heavenly Cake Bake Along</em>, most of whom had trouble unmolding the caramel atop the Caramelized Pineapple Pudding Cakes, we have retested the recipe and have come up with some tweaks to make the unmolding much more reliable and effective. Changes are in bold. p. 344 Make the Caramel: ...allow it to boil undisturbed until it turns a <strong>deep</strong> amber...350˚F/175˚C. p. 345 Bake the Brioche Pudding: Remove the puddings from the water bath.Let them cool on wire racks and refrigerate them for 6 up to 12 hours. Unmold the Brioche Puddings: ...invert the puddings onto serving plates. Allow them to sit for 10 minutes before lifting off the molds. On the master chart for butter cakes on page 490, Level 6 the rectangular pans make only one layer.also baking time should be reversed, i.e. 35 to 45 minutes for the 13 by 9 inch rectangle, 40 to 50 minutes for the 18 by 12 inch rectangle. Coulibiac p 109 is so good it may serve only 12! p 98 add Note: The ancient Chinese technique of brining shrimp does wonders to improve the flavor and texture of shrimp that has been frozen. It works particularly well in this dish because the infused slight saltiness it gives the shrimp plays well against the tangy sweetness of the sauce. To brine the 1 pound of unshelled shrimp: In a small bowl stir until dissolved: 1/4 cup of salt (preferably sea salt), 1/4 cup of sugar, and 1 cup of boiling water. Pour this mixture into a larger bowl and add 3 cups of cold water, a few handfuls of ice cubes, and the shrimp. Refrigerate for 2 hours. Drain and rinse well under cold running water. Peel and proceed as above but eliminate the salt from the marinade. Make the coulibiac, wrapping it in brioche as directed. Transfer it to a buttered baking sheet but do not glaze and decorate until shortly before baking. Refrigerate the remaining glaze and the pastry decorations. Wrap the buttered foil band around the sides of the coulibiac and tie with the cord. Fold down the excess foil and place a piece of plastic wrap sprayed lightly with vegetable shortening directly on the surface of the dough. Refrigerate for up to 6 hours. Thirty minutes before baking, remove the coulibiac from the refrigerator and fold the foil back up to its original position. Cut out the steam vents, glaze and decorate. p 145 ..Wrap the wings loosely with foil. If crisp skin is desired, brush with oil. p 312 Change baking time to 20 to 30 minutes. Insert after…lift out the brownies: Wrap well and chill for at least 1 hour. under Refrigerate a mixing bowl…cross out In a small bowl place the raspberry jam and whisk in the Chambord or water and replace it with: In a 2 cup heat-proof measure, place the raspberry jam and microwave on high power for 5 minutes or until reduced to 3 fluid ounces (6 tablespoons). Or simmer on low heat in a small heavy sauce pan, stirring often. Set aside to cool completely. By the way, if the potatoes are too dry when frying them, cover them for the first part of the frying. Missing Text on Page 198 Pâte à Picnique In a mixer bowl, beat together the butter, sugar and salt until well-mixed. Add the flour and mix on low speed until the flour is incorporated and the mixture crumbly. Beat in the milk and egg mixture just until incorporated. Add the cocoa, almonds and optional cinnamon and mix well. Form the dough into a disc, wrap with plastic, and allow it to rest in a cool place for at least 1 hour. Roll out the dough 1/8" to 3/16" thick between sheets of plastic wrap. Cut out round discs and place them on the prepared cookie sheets at least 1-inch apart. (Re roll the scraps.) Bake for 10 minutes or until set. Remove to racks and cool. Sandwich together with the ganache. If you flour your hands before rolling the balls of dough, the cookies will be rounder, as show in the picture. If you don't flour hour hands the cookies will have more almonds adhere to them but will be flatter. p 94 under Food Processor Method...Remove half the nuts (about 2/3 cup / 71 grams). p 100 under Caramel Topping...to avoid spattering. Lumps will form but they will dissolve with further cooking. under For Both Methods:...cross out ...At first the dough will be dry and crumbly, but the heat of your hands quickly makes it blissfully soft and supple....Bake for 45 minutes. 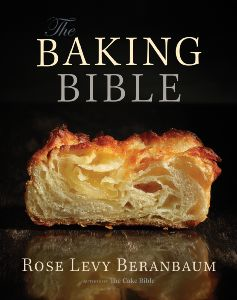 The following is the partial list of errors and corrections from The Pie and Pastry Bible by Rose Levy Beranbaum. Use the comments below to report anything else you find. Almost everything has been corrected by the 9th printing. Blind baking (prebaking) flaky pie crust, page 19, For the most even baking, set the tart pan or pie plate on a preheated baking stone or baking sheet. After removing the weights start checking for doneness after the first 3 minutes. weight of sugar for the Crumb Crust for a 10-Inch Pie on page 69, it should be 0.6 ounce/17 grams. In the Custard Filling for the CRANBERRY CHIFFON PIE on page 152, the cranberry purée is strained into the bowl with the sieve set over it to receive the custard. They are then stirred together. In the Fruit Turnoverson page 135, the unsalted butter is 1 tablespoon but the weight is 0.5 ounce/14 grams. on page 137, for the Mini-Turnovers, roll each piece of dough large enough to cut a 4 inch circle. Also, for the blackberries, use the larger amount of cornstarch if not reducing the liquid and the smaller amount if reducing the liquid. In the Custard Filling for the GINGERY PEAR CHIFFON TART on page 164, To ensure that all of the gelatin dissolves and offers a firm texture to the filling, it is best to soften it in 2 to 3 teaspoons of the reserved poaching syrup. Stir to moisten the gelatin and allow it to sit for a minimum of 5 minutes. (If longer cover it tightly with plastic wrap to prevent evaporation.) After stirring the poaching liquid into the egg yolk, stir in the gelatin mixture. In the LEMON MERINGUE PIE on page 178 under "make the filling," do not use a double boiler and be sure to bring the egg mixture to full boil to ensure that it will thicken properly. An instant-read thermometer should read 180˚F/82˚C. (If lower than 170˚F/77˚C the amylase enzyme in the yolks will reverse the thickening.) On page 180: Cool in a draft free place for about 1 hour and then refrigerate for a minimum of 3 hours. Serve refrigerated. In the CHOCOLATE CREAM PIE on page 204 under "make the filling," it should read remaining 2-3/4 cups of milk. In the APRICOT-CHEESECAKE TART on page 208, in the chart, the yolks should be 1.3 ounces/36 grams. On page 209, Add the crème fraîche or the cream, egg yolks, and remaining white. In the FIG TART WITH MASCARPONE CREAM on page 211, the Marsala should be 1 to 2 tablespoons/0.5 to 1 ounce/14 to 28 grams. In the CHOCOLATE OBLIVION TARTLETS on page 308, the amount for the eggs should be only 3 eggs/5.2 ounces/150 grams. In the Hungarian Poppyseed Strudel on page 403, proof the yeast with 1/2 teaspoons of sugar not 1 teaspoon of sugar. In the CRÈME BRÛLÉE CUSTARD on page 440, the filling is 2 3/4 cups. In the BRANDIED RAISINS on page 514, the cognac is 1/2 liquid cup. In the PASTRY CREAM on page 560, the 2 cups of half and half weigh 17 ounces/484 grams. Note: I have found that it is best to apply the foil ring to the protect the edges of the pie crust from the beginning of baking. p 89 and 592 for the streusel (crumb) topping, for a crisper topping melt the butter before adding it. p 262 under Pointers...If a 3 inch pear is available, poach it along with the other pears, slice it and place it in the center. During baking, the pears will shrink making space for it. p.294 Gâteau Basque: Add about 1 tablespoon of cream to the yolk and vanilla. After mixing the dough pinch it together and it if still crumbly and won't hold together add a tiny bit more cream. Change baking temperature to 325˚F. Karen Question: I am planning on making the chocolate butter wedding cake for a friend's wedding next weekend. Your chocolate base cake formula appears to have more butter (530 grams butter for 12 inch layers or 75.67 grams x rose factor 7) that the 3-tier chcolate butter cake to serve 150 (400 grams butter for 12 inch layers) although the other ingredients are the same. Could you please advise what is the correct amount of butter to use? Rose Reply: You're right! Originally I made the cake just as it appears on page 486-487 but decided to add more butter to make it more moist. You could instead just add a little syrup. I changed it in the base but forgot to change it on the larger recipe. If you opt to go with the higher butter it would be 16 oz./454 grams for the two 6 & 9 inch layers and 18.5 ounces/525 grams for the two twelve inch layers. Do let me know what you decide to do! Either way it will be delicious and chocolatey! The Bread Bible Goes into New Printing! at last the new printing of the bread bible has arrived with all the corrections! it will list 3 on the page after the title page which means 3rd printing.thank all of you who have made it possible to have this book that i adore in it's best shape.